Part 4: Specific Populations. Economics and mental health (R. Frank and T. McGuire). Long term care (E.C. Norton). The economics of disability and disability policy (R.H. Haveman and B.L. Wolfe). Child health in developed countries (J. Currie). Part 5: The Medical Care Market. The industrial organization of health care markets (D. Dranove and M.A. Satterthwaite). Not-for-profit ownership and hospital behavior (F.A. Sloan). 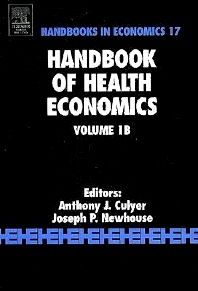 Economics of general practice (A. Scott). Waiting lists and medical treatment: Analysis and policies (J.G. Cullis et al.). Economics of dental services (H. Sintonen and I. Linnosmaa). The pharmaceutical industry (F.M. Scherer). Part 6: Law and Regulation. Liability for medical malpractice (P.M. Danzon). Antitrust and competition in health care markets (M. Gaynor and W. Vogt). Regulation of prices and investment in hospitals in the United States (D.S. Salkever). Part 7: Health Habits. The economics of smoking (F. Chaloupka and K. Warner). Alcohol (P. Cook and M. Moore). Prevention (D. Kenkel). Part 8: Health. The measurement of health-related quality of life for use in resource allocation decisions(P. Dolan). Economic epidemiology and infectious disease (T. Philipson). Part 9: Equity. Equity in health care finance and delivery (A. Wagstaff and E.K.A. van Doorslaer). Equity in health (A. Williams and R. Cookson). Tony Culyer is Ontario Research Professor of Health Policy & System Design in the faculty of Medicine at the University of Toronto (Canada) and a professor of economics at the University of York (England). He is a founding father of health economics. He was founding co-editor of the Journal of Health Economics and the founding Organiser of the (UK) Health Economists’ Study Group, the first of its kind anywhere). He was, from its creation in 1999 until 2003, Vice Chair of the National Institute for Health and Care Excellence (NICE) and is chair of NICE International’s Advisory Committee. He has been a member of or chaired many UK National Health Service committees (especially those to do with research) and trusts and was responsible for the 1994 report that led to the redesign of the NHS's system for supporting R&D. He is chair of the Office of Health Economics in London (England). For many years he was chair of the Department of Economics & Related Studies at the University of York (England) and, for six of them, was also deputy vice-chancellor of the university, with special responsibility for the University’s research infrastructure and performance. He is currently Editor-in-Chief of a new on-line Encyclopaedia of Health Economics. His Canadian connections include having been Chief Scientist at the Institute for Work & Health in Toronto and chair of the Toronto-based Workplace Safety & Insurance Board’s Research Advisory Council. He is a board member of the Canadian Agency for Drugs and Technologies in Health (CADTH) and has served on several Ontario Ministry of Health and Long Term Care committees. Dr Culyer has published around 300 articles in various books and scholarly journals and he has written or edited 33 books. A collection of his essays, called The Humble Economist, edited by Karl Claxton and Richard Cookson, was published in 2012 (University of York & Office of Health Economics) and is now available on-line free of charge. He is a founding Fellow of the Academy of Medical Sciences. His honours include Commander of the British Empire, Hon DEcon (Stockholm School of Economics) and Honorary Fellow of the Royal College of Physicians of London.